I went 'round and 'round trying to decide which to do: potato buckets, or potato towers? 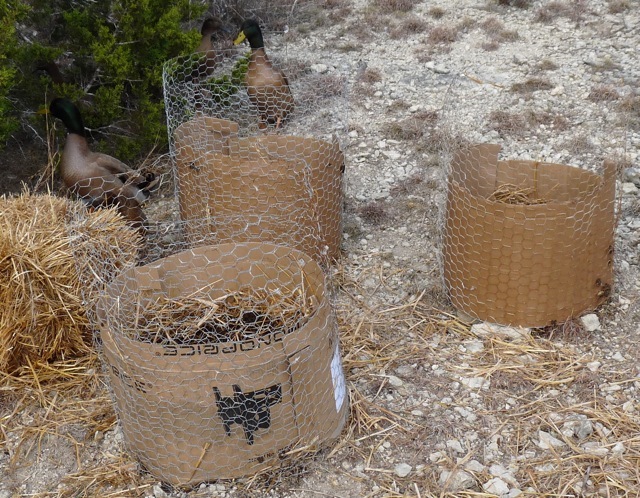 As the soil here in the Hill Country is not amenable to growing potatoes in the traditional manner - heck, you need actual SOIL for that - settled on growing potatoes in buckets (seemed easier all around). Other projects came along, taking away the buckets I wanted to use. 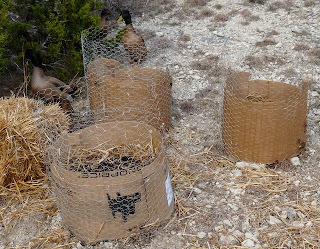 Rather than buy more buckets, decided to make do with the materials I had on-hand and create chicken wire mini potato towers instead. Photo: potato towers, and ducks. Ducks! The mini-towers are about two feet wide, and stand about 30" tall. Used some old chicken wire for the form. 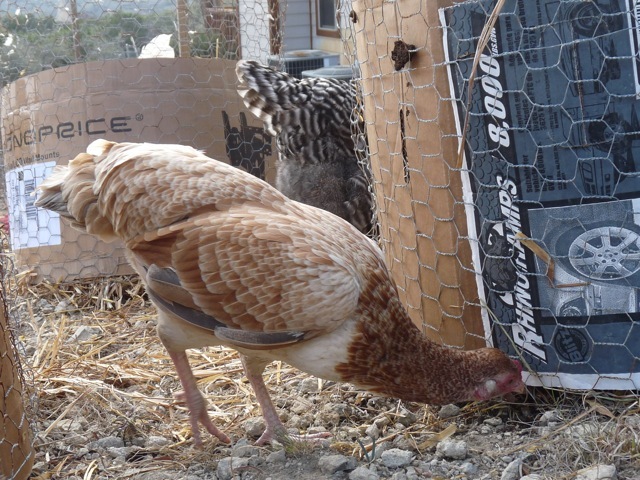 Lined the interior with recycled cardboard so the hens can't peck out the contents as easily. The cardboard will also help keep the soil cooler and hold in moisture better - a big consideration 'round here, especially as we're already experiencing days in the mid 70's ℉. 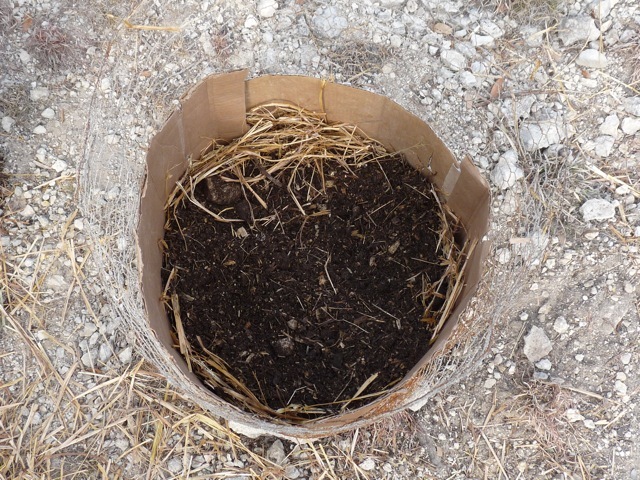 Also added an extra layer of straw around the sides, and filled each tower part-way with nothing but pure compost (and a bit of straw to "lighten" the mix). Not all folks have luck using straw - someone (I forget who - what do they say is the first thing to "go" when you get older?) mentioned that using straw led to more problems with disease in her spuds. I'll be keeping a close eye during the growing season. Photo: Cinnamon, proving my point. Growing the spuds: according to different web sites, what you do is plant a seed potato, sprouting-side up, into the compost (or soil mix). As the potato puts forth a stalk & leaves, begin mounding up soil/compost to the bottom of the leaf structure. Keep mounding up as the potato stalk/leaves grow taller, and keep the soil moist! The potato will then send out more root shoots through the stalk which will then become tubers through the now soil-covered stalk. I'll add another lining of cardboard to the mini-tower once the soil level gets higher. I'll be planting the spuds this Sunday after work, as that's when the Farmer's Almanac claims is a fortuitous time for spud-planting. Call me superstitious, but gardening can be such a crap-shoot that I'll take all the advantages - real or imagined - that I can get! Photo: the girls getting serious about their job. 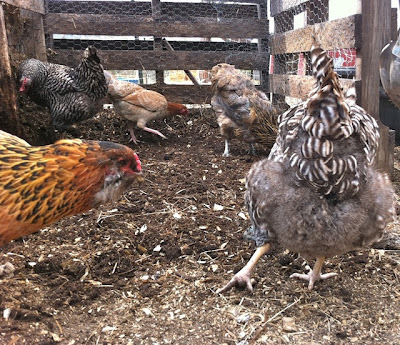 Speaking of compost: the hen ladies were quite helpful in getting the compost ready to use in the potato towers. I cleared out one of the pallet bins of ready-to-go compost, shovelling loads into old/damaged kiddie pools we've hung onto. 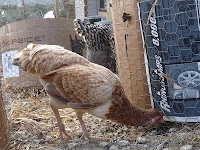 The hens then scratched through the compost in the pools, digging out bugs, eating seeds or any wild shoots, and breaking up mix. Got the idea from Redneck Mother, a Texas gardener who is no longer blogging (bummer) else I'd link her brilliant idea. For her compost "sifting" container, she used those low/wide underbed plastic clothes bins you can get inexpensively at a dollar store. 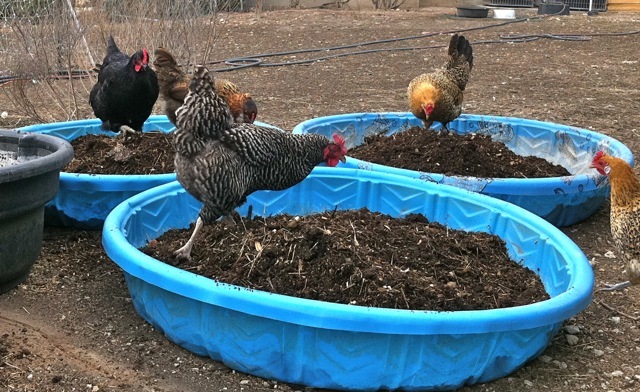 The kiddie pool method seems to work best (and most frugally) for us: our ducks & geese (and dogs) use the pools until they bust, then we use the busted pools for other projects later on. Bonus: the pools are highly UV-resistant, and won't break down after a summer in the sun. Win! 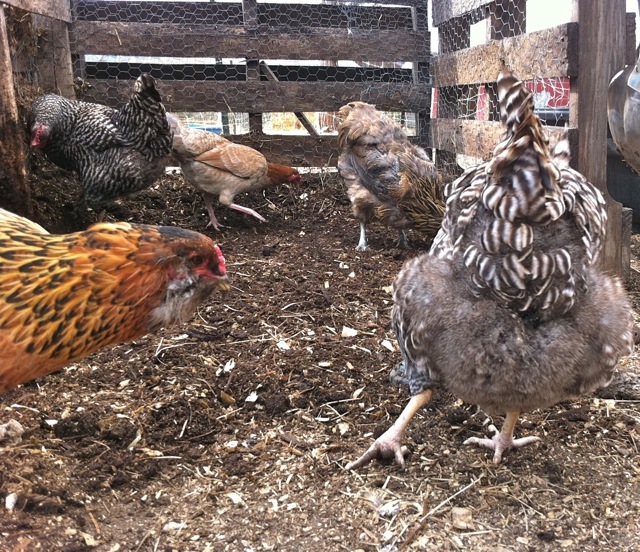 Photo: The girls finishing the job in the compost bin. I'm trying potato-buckets for the first time this year, too (well, potatoes at all are a first!) and your blog inspired me to learn about growing them in straw. There are a lot of failed potato stories on the interwebs, so I'm super intrigued to see how it all turns out! 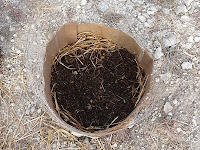 I use my sunshine mix bags for potatoes - just make sure to poke a couple of holes in the bottom for drainage. Pine straw, ladies!! Potatoes LOVE pine straw and grass clippings! We set a layer of pine straw in our trenches before laying out our potato sets and covering with a couple inches of soil. @Kara: good luck to you! I plan to post progress updates. @DSP: will have to look up sunshine mix bags, thanks! @WeldrBrat: would you believe the soil here is too alkaline for pine trees?!! We've got live oak, and ash juniper (aka Texas Cedar), and that's about it.